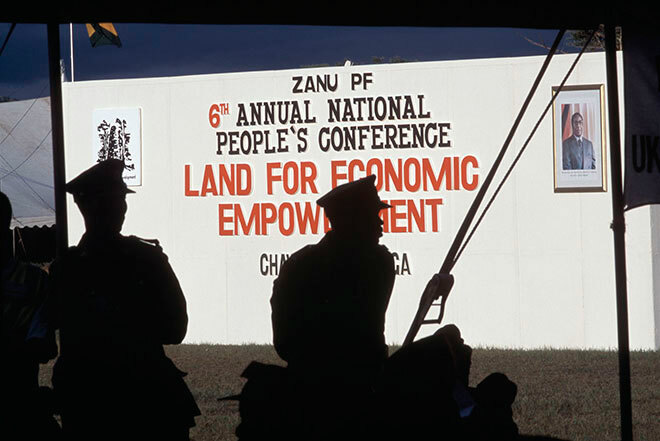 Police stand guard outside a tent where delegates attend the sixth annual Zanu PF National Peoples Conference in Chinhoyi. A billboard in the background bears a slogan of support for the government’s land reform program. In 2002, I visited Zimbabwe on a National Geographic assignment to document the land conflicts that were taking place there under Mugabe’s regime. 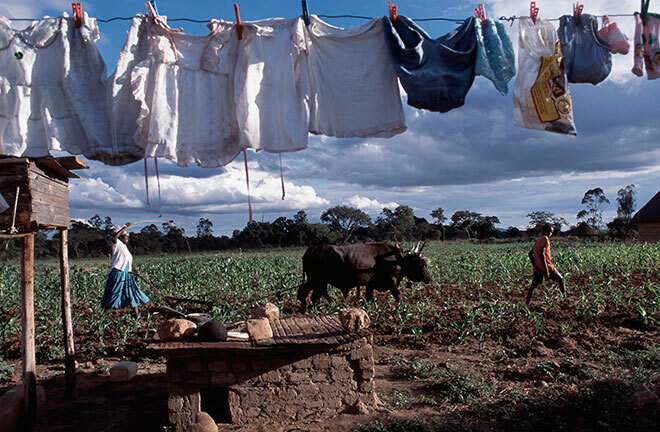 At the time, many of Zimbabwe’s white farmers were being forcibly driven from their land. While land redistribution was an important way to reduce inequality and address the wrongs of the country’s colonial past, the way in which it was carried out was questionable. Many of the country’s elite, including government ministers, military generals and Mugabe loyalists, benefitted disproportionately from the land acquisitions, and the nation’s economic and social fabric rapidly deteriorated. 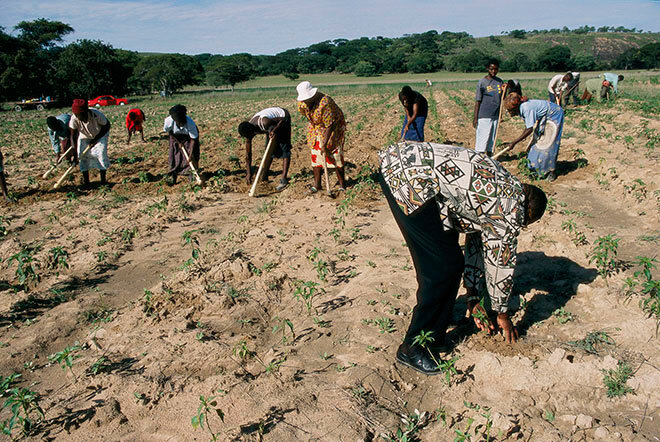 Zimbabwe’s agricultural productivity was particularly impacted, and many black farm workers lost their jobs and homes as the farms they worked on were taken over. I had spent a lot of time in Zimbabwe throughout the 1990s. It was alarming to witness the transition that took place during this short period of time from a peaceful and tolerant environment to one of intimidation and fear. 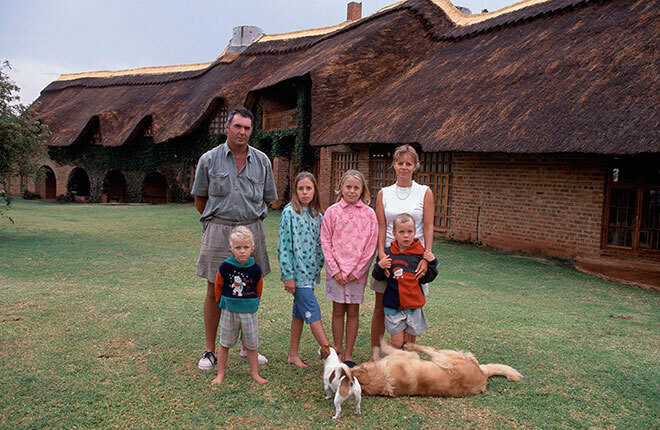 Farmer Bruce Chapman poses with his family in front of their luxurious house on their farm, Rukoba, in the Trelawny District. Rukoba was a large, successful farm with 300 workers, a school, and more than 2000 people living on the land. 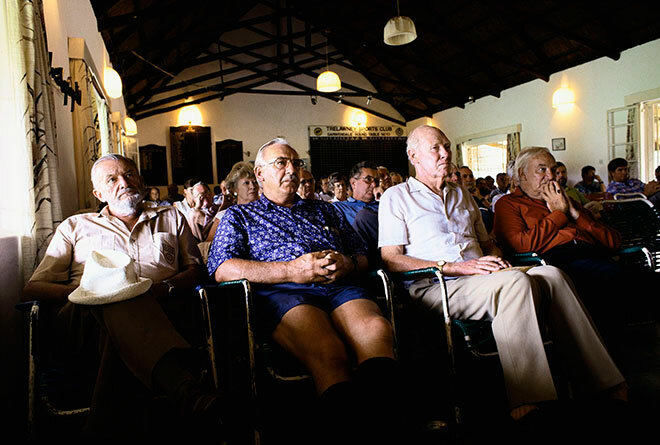 At the time Bruce was one of the few white farmers to have been unaffected by the land acquisition. Only 35 of an original 135 white farmers remained in this district, and many were struggling to stay on. Three years after this photograph was taken, Bruce’s farm and house were forcibly taken over by the Governor of the province. 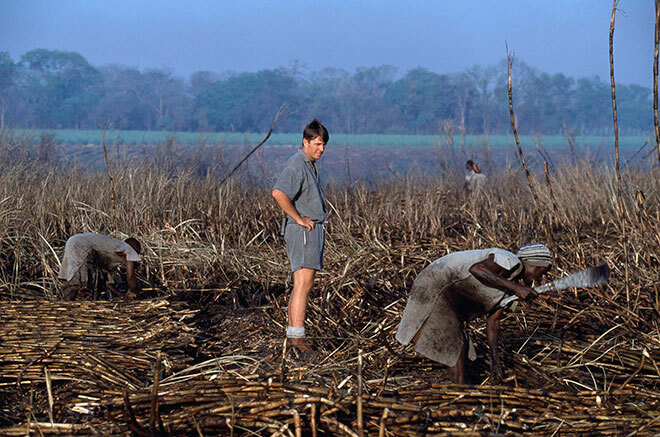 Brian Alford supervises workers cutting sugarcane on his farm near Chiredzi in southern Zimbabwe, which he had purchased 15 years earlier. Despite extreme pressure he was among the minority of white farmers in Zimbabwe who had managed to keep farming their land. Within a year of this photograph being taken, his family had been pushed off their land and had to leave the country. 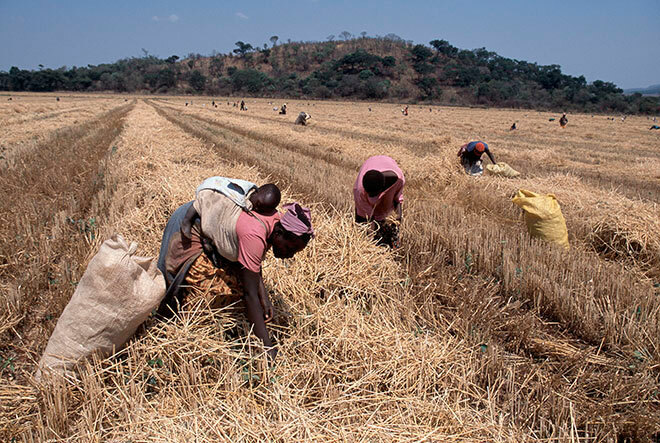 Impoverished locals glean leftover grains of wheat on Esperanza farm, near Nyamandhlovu. At the time, widespread hunger due to the government’s economic policies and their takeover of white farms, was forcing local communities to scavenge in any way they could. 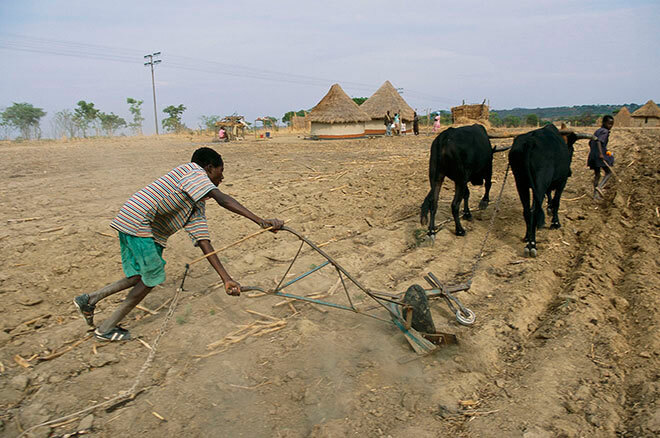 Farmers Walter and Tinashe Hondomoto plough a field that their family had received two years earlier as part of the Zimbabwe government’s land reform program. The previous owner, Peter Bowen, had been evicted from this farm (Nyamuvu Farm) in the Guruve District. 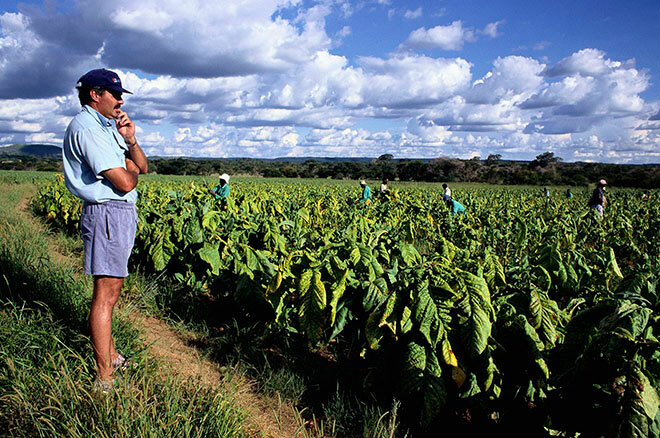 Bruce Chapman oversees the harvesters on his tobacco plantation in the Trelawny District. Black and white students wait to enter a classroom at St George’s School in Harare. 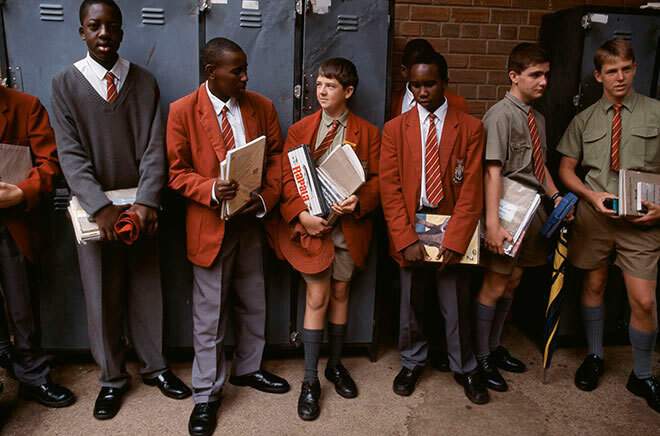 This was a Catholic boys school that educated the sons of white farmers alongside those of the black ruling elite. 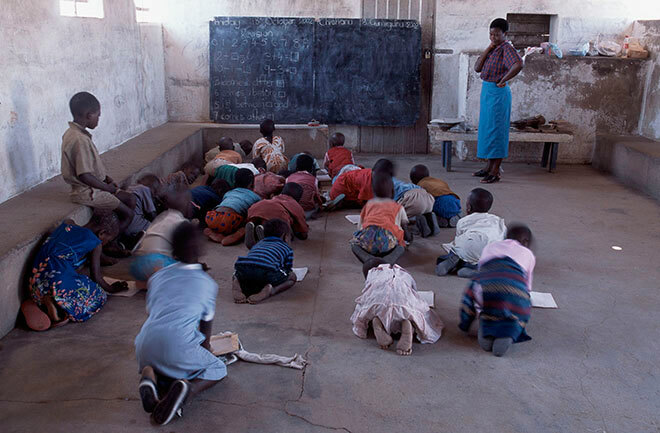 Pupils study at a school on a farm near Mazoe, occupied by new A1 settlers following the division of a government-acquired farm into many parts. Zimbabwe used to have one of the best education systems in Africa, but with the economic crisis, educational conditions rapidly declined. Many of the teachers struggled to survive on their salaries as a result of extreme inflation. 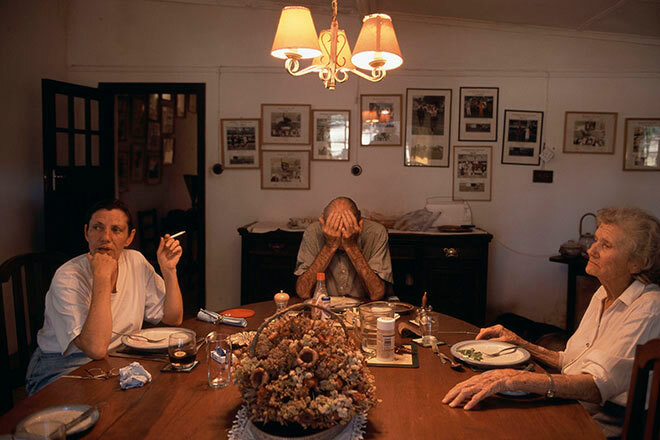 Still shocked after going through a horrific ordeal, Dubbles Draper, her husband Robert and their daughter Leigh sit at their dining room table. The previous evening, a group of thugs linked to a new settler on their farm had burst into their house and attacked both Leigh and Dubbles, trying to force them off the land. Bob had been born there 79 years ago, and Dubbles had lived there for 52 years. Dubbles was one of the best-known horse trainers and stud breeders in Zimbabwe and still worked actively at the time. In the months after this picture was taken, they were finally forced off their farm. Farm worker Thomas Kwaramba sits by a fire at an emergency camp in Epworth, on the outskirts of Harare. Most of the 145 refugees had been evicted from a farm called Chipesa Estate along with Ian Kay, the white farmer who employed them. 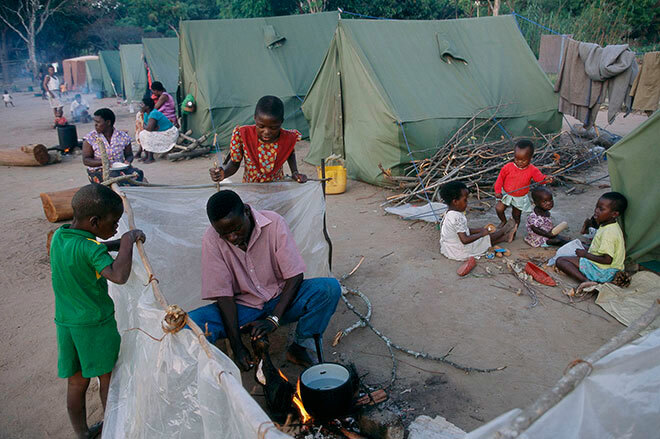 As their parents had been migrants from neighboring countries, they had no family homes within Zimbabwe’s communal areas, and so had nowhere to go. About 250,000 farm workers lost their jobs across the country during this time. Only a few were resettled under the land reform program, which focused on those blacks living in communal areas. 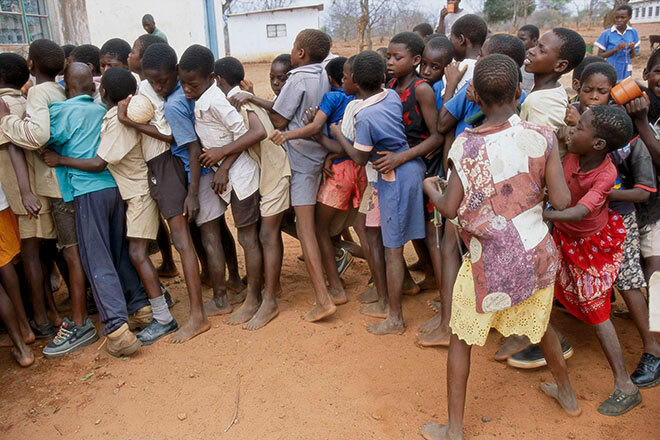 Jostling for position, students at Jabula Primary School in the Hwange Communal Area line up for Mageu, a nutritional drink provided by a local charity. People had to pay dearly for their staples, if they could find them at all. Fudd Dubois comforts her daughter, Dayna, as she and some of their workers pack up their house. She had returned briefly to their property to pack some belongings after being forced out at gunpoint by war veterans ten days earlier. Their house was on a game farm in the Gwai Valley Conservancy, owned by Fudd’s family. 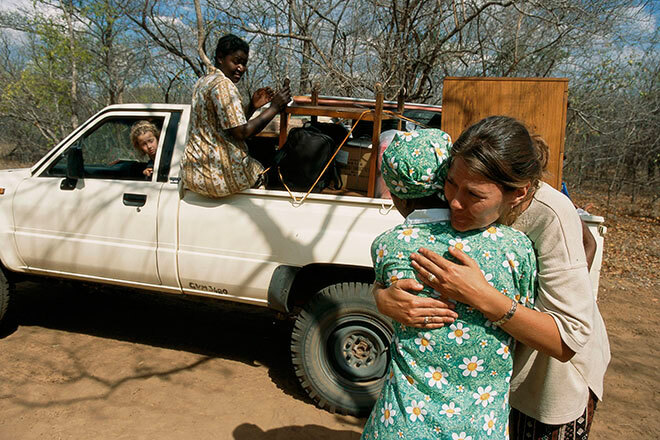 After being forced off her game farm, Fudd Dubois cries as she says goodbye to former employee Gladys Nyoni. Looking on are her daughter, Dayna, and maid, Diniwe Madimba, who chose to accompany the family. Laying claim to land he says colonists stole from his ancestors, computer engineer Tapfumaneyi Kidson Manzira inspects his paprika seedlings. This farm was given to him as part of the government’s controversial land acquisition programme. The Chitima family plough their small piece of land in Wedza District, where the farm invasions in Zimbabwe first began. They were one of 68 new A1 farming families to have been given a plot of land on what had once been Shaka Farm, owned by white farmer Paul Grinham. Each had 12 acres, upon which they were planting beans, maize, tobacco and paprika. 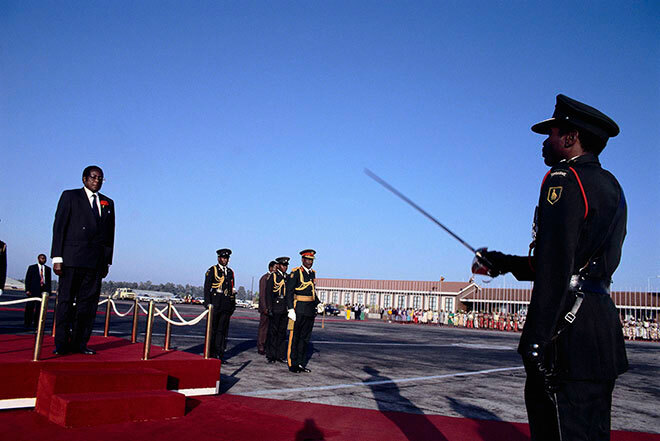 Republic of Zimbabwe President Robert Mugabe at a ceremonial reception in Harare airport, upon his return from a diplomatic trip to Rome.